We at AIGA think nuts-and-bolts business information is vital to any self-employed designer, so we created the business-focused Blueprint series to find out if the rest of the self-employed design community does too. Turns out they do: The event was sold out, and we practically had to kick attendees out the door after it ended, they had so many questions for our panel. Speaking of the panel, I can’t say enough good things about this talented and experienced group, and I’m honored to call them my friends. Mark LeRoy, the founder of Escape Hatch, a luxury travel company, and silverECHO, a brand strategy, marketing and design agency. The discussion was lively and thoughtful, stocked with behind-the-curtain, practical insights and suggestions. We could have easily talked another hour or two, and barely scraped the surface of both the topic, and the panel’s collective knowledge on it. Above: AIGA Los Angeles Blueprint: Freelance panelists from left to right: Jason Adam (moderator), Mark LeRoy, Heather Parlato, Spencer Cross, Petrula Vrontikis. You’re a business owner, not a designer. 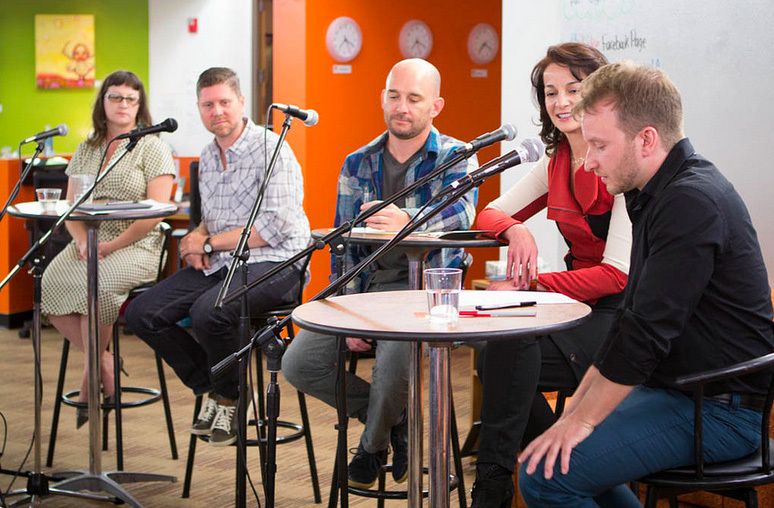 On average, all four panelists spend about 30% of their time designing. The rest is spent running their business, or in business development. Titles are important. Not one of our panelists refer to themselves as a “freelancer,” opting instead for terms like solo-practice (or in Mark’s case, Contract Marketing Director), which offer elevated positioning. Where you decide to work is a personal decision. The panel was split on working alone from a home office, or working from a co-working space or shared office. Heather recently gave a shared office space a go, but found it too distracting. The consensus was this is a very personal choice. For those opting to work at home, Spencer suggests dogs. Freelancing allows you to keep a larger portion of your earned money. For those considering making the leap to freelancing full-time, and concerned about financing the jump, Heather suggested that one can expect to pay significantly less in taxes as a freelancer than she did as a full-time employee. Flat fees vs. billing hourly. Our entire panel typically bills projects on a flat-fee basis, vs. billing hourly, with a few small exceptions, such as revisions or production work. “Work directly with the client” except when… Petrula explained: If you have a very specialized skill, such as an illustration style, etc., you can command a premium fee for your work, and it may be beneficial to subcontract through other agencies. Just ask lots of questions and make sure you can use it in your portfolio. Staffing Agencies are great in a pinch, but watch the strings. If you’re going to work with a staffing agency, read the whole contract. They likely have strict non-compete clauses included. And we covered that in about 10 minutes. This is one smart group, and I can’t wait to get them together again. Here at Hexanine, we’re also committed to elevating design as a professional craft through a focus on design thinking and brand strategy. We feel strongly that the more our clients utlize us as strategic consultants, the more value we can bring to the table — and their organizations. Many thanks to AIGA LA Event Programming Chair René Quintanilla, and event producers Janette Jackson and Jenn de la Fuente for producing the event, and to all of our AIGA Los Angeles volunteers for their hard work as well. 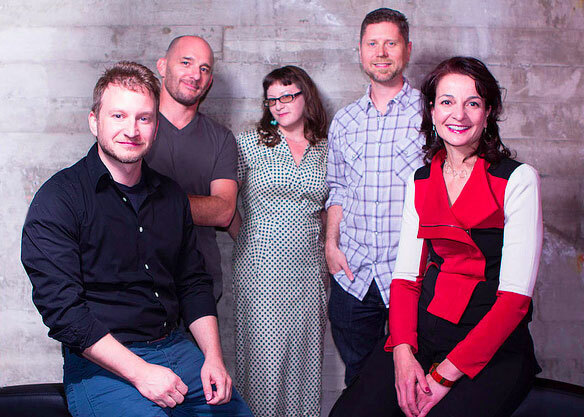 If you’d like to learn more about AIGA Los Angeles, visit our spiffy new website. Finally, a huge shout out to Paul Dimalanta who provided the fantastic pictures. What I wouldnt get for possess an issue together with you regarding this. You just allow them to know plenty of items that come from nowhere quick during which Web advertising and marketing fairly sure Identification use a fair picture. Woh I take pleasure in your articles , saved to favorites ! . Can I mainly say precisely what a aid to uncover any person who absolutely is aware of what theyre speaking about over the net. You certainly find out how one can bring a difficulty to light and carry out out it crucial. The food plan should see this and might even see this side of one’s story. I cant believe youre much less nicely-appreciated because you utterly provide the gift. Hello. Great job. I did not expect this. This is a outstanding articles. Thanks! do with Girl gaga! Your individual stuffs nice. All the time take care of it up! Local com este write-up, eu realmente assumir este site precisa significativamente muito mais consideração. com toda a probabilidade ser novamente para ler um monte muito mais, obrigado por essa informação. magnificent publish, very informative. I wonder why the opposite specialists of this sector do not understand this. at the net the easiest ffactor to have in mindd of. I say to you, I certainly get annoyed whilst other folks consider worries that they just do not recognize about. You managed to hit the nail upon the higgest as well as outloined out the whole thing with no need side-effects , other folks can take a signal. I think what you published made a great deal of sense. However, what about this? I got this site from my pal who informed me concerning this web site and now this time I am visiting this web page and reading very informative articles here. me to visit this website, it contains important Information. Unfortunately, many reviewers don’t recognize how decisions made by the director, cinematographer and composer made a profound impact on the visceral reactions and intellectual responses of audiences. best choice for home moviemaking and editing. It’s mostly done in these very straight-on medium shots. learned more clear from this post. I’m very glad to see such fantastic info being shared freely out there. Wonderful beat ! I wish to apprentice even as you amend your site, how can i subscribe for a blog web site? Browse us for more hacking cheats. Good day everybody! iphone4. I’m trying to find a theme or plugin that might be able to fix this problem. Great blog уoս have herе.. It’s difficult to find hiɡһ-quality writing ⅼike yours nowadays. І really apprｅciate people like yoս! Take care!! this site is in fact pleasant and the visitors are really sharing good thoughts. to pay a visit the web site, that’s what this web site is providing. a certain scheme. Similar are the cases with features like databases and customer support. Wow.. You added blueprint here.. I just excited about this blueprint event..